RDtoS5 is a lightweight and easy to use proxifier for Windows Remote Desktop connections. It allows you to redirect RDP traffic through a SOCKS5 proxy. It works differently from common proxifiers and can be used under limited user accounts. Windows XP – Windows 10 are supported (32 and 64 bit versions). IPv4, IPv6 and Domain Names are supported. onion addresses can be used with a Tor SOCKS5 proxy. Extremely lightweight and low resource consumption. Native WinAPI design – NO external libraries or frameworks to install. Detailed Log console can be started to troubleshot connection issues. 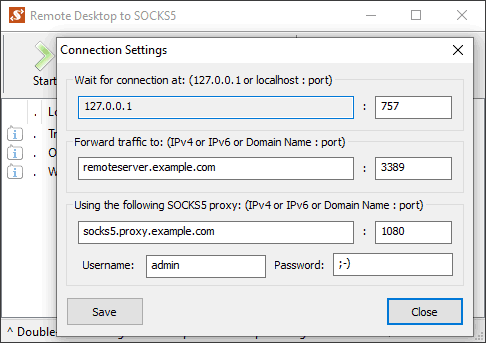 Our Remote Desktop to SOCKS5 tool serves a single purpose of redirecting RDP traffic trough a SOCKS5 proxy. It acts as a server, listens for a connection to a local port (e.g. “localhost:757”) and redirects data to a selected remote server trough a chosen proxy. Remote server and proxy parameters are known, thus there is no need to intercept normal system behavior. The only thing required is to set Windows Remote Desktop client to connect to the RDtoS5’s local address like “localhost:757” and RDP traffic can be redirected trough a SOCKS5 proxy. No evaluated privileges or system hooks are required, 32 and 64 bit systems and clients are supported, other connections or programs are not affected in contrast to universal proxifiers. Free for personal use in non-business environment.